I try to add a unicode URL into the bibliography and LaTeX automatically converts the cyrillyc letters into percent-encoding. I found that hyperref is responsible for this, but I found no way to disable it. It's OK to encode the link itself, but in document I don't need this, the reader wants to see letters instead of character codes. I really don't want to print this https://ru.wikipedia.org/wiki/SLAM_(%D0%BC%D0%B5%D1%82%D0%BE%D0%B4) on papaer, this gives no useful information to reader. 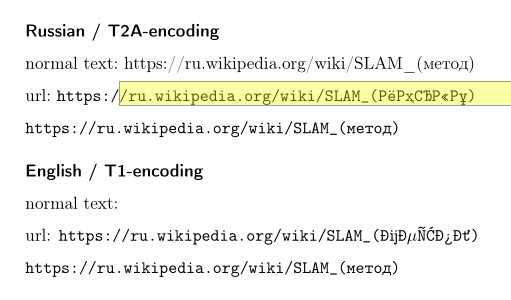 I want to have https://ru.wikipedia.org/wiki/SLAM_(метод) in the URL. which isn't a sensible output either. As the comment made clear that pdflatex solution is needed some background info: As the following example demonstrates url.sty can't in a realiable way print non-ascii chars. Depending on the surrounding language (and also depending on packages like hyperref) you get all sorts of wrong output. The only way to get a perfect output is to handcraft it. This means that if you want this from a bib-file you will have to put the print version of the url in some extra field and change the biblatex macros for the url to use them. Using XeLaTeX, there actually is a solution. (The file 1.bib is as above.) The code uses a new feature of biber (starting with version 2.8): it provides the original, unconverted URL data in the field urlraw (and there is no longer an option --nouri-encode, BTW). We redefine the url field formatter to call \href with the data from urlraw as the second argument. For CJK characters in bibliography entries there is also a simple solution. And here an input example. \url (and \nolinkurl) handle URLs in math mode, and option CJKmath activates CJK support for math. A minor disadvantage is that strings of CJK characters can't be broken. In most cases this shouldn't be a problem. However, if you really need that, a more elaborate solution is necessary that avoids \nolinkurl. To allow line breaks after / (but not between the two slashes in //) we use the \XeTeXcharclass feature: We define a new character class for /, then calling \allowbreak if we have a transition from / to a normal character. It is straightforward to add more characters to the new class if desired. Because we define a separate class for /, xeCJK's mechanism doesn't get applied to the character following it, and we have to insert the corresponding code into our class token list (this is a hack; hopefully, there will be a better solution in the future). The five lines after \allowbreak have been taken from file xeCJK.sty (version 3.5.1), lines 740ff. Since xeCJK is written in LaTeX3, we use \csname to call the macros. Note that the above code covers only the simplest case, namely / followed by an ordinary CJK character (which xeCJK assigns to class 1). Not the answer you're looking for? Browse other questions tagged biblatex hyperref biber unicode urls or ask your own question. Selective breaking of biblatex urls?